Want to generate more revenue and grow your community? 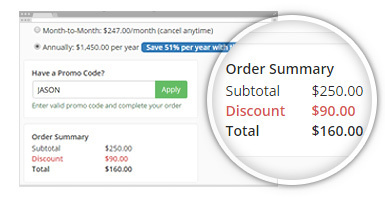 The Easy Coupon Codes add-on is an incredibly simple way to give members additional discounts when signing up to your website. Provide your members with percentage-based and dollar-value discount codes and track the usage of all of your active coupon codes. You can even set start and expiration dates for coupons! QUESTION 1: Do you want more members to join your website? QUESTION 2: Do you want to generate more revenue from paying members? QUESTION 3: Do you want to increase your brand’s online visibility? QUESTION 4: Do you want a strategic tool to help market your website? QUESTION 5: Do you want to track conversions from affiliate partners?